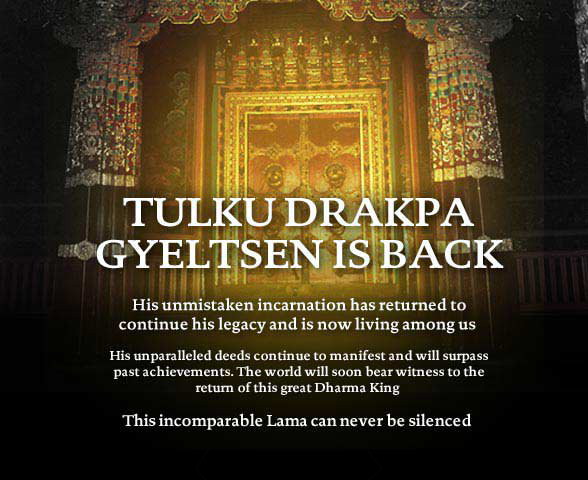 18 months ago, Shugdenites proclaimed a decades-old secret....that Shugden was alive, again. Lies, always lies....used to battle Buddhism, NKT survivors and anyone not succumbing to NKT's charms. NKT prefers allegiance to a fictional nightmare. Why? Because it's profitable. Compassion requires too much for NKT. Likely, Shugden will die before making living public appearances. Paraphrasing Winston Churchill....Shugden "is a riddle, wrapped in a mystery, inside an enigma." A living Shugden could hardly live up to his myth...eg, stopping the rotation of the earth for 3 days, wreaking massive environmental and biological havoc, in order to get out of paying his bar bill...a strange feat boasted by Kelsang Gyatso in his global campaign to save Shugden mythology. A living Shugden requires no NKT intervention. Alas, there would be no purpose for NKT if Shugden is alive as proclaimed 18 months ago. Kelsang Gyatso's war would have no market value. The ad claims "This incomparable Lama can never be silenced." Why then, after reincarnating decades ago, is he silent?